Legionella is an ongoing issue in plumbing systems globally and a topic Plumbing Connection has written about frequently. Now, Adelle King outlines two new product solutions helping to address the problem. The issues surrounding legionella and water systems are well documented, particularly in the health and aged care sectors where significant vulnerabilities have been found. As a result, there are a number of solutions being developed to help reduce the risk of legionella colonisation. However, according to experts at the Legionella Conference 2018, which was held in the US in May, most of these have generally approached the issue from an emergency management and reactive perspective rather than as a preventative effort. Now, two new product solutions, Quantum Health’s LegioGuard Ultra system and LuminUltra Technologies’ Second Generation ATP testing kit, have entered the market aimed at creating a water safety culture that reduces the incidence of legionella outbreaks and improves the response to them. Quantum Health has had over 30 years’ experience via its subsidiary Quantum Energy in the plumbing field and has vast experience in the health sector as a leading medical distribution, solutions provider and manufacturer. The company’s LegioGuard system is a culmination of years spent by the company developing a ‘front of line’ tempering valve system. “From this, we analysed the shortfalls of existing hot and warm water systems and where legionella was colonising within these systems,” says Quantum LegioGuard general manager of sales Scott Goulter. The result is a tempered water delivery system that provides sanitised warm and cold water to a circulating water system. All water to sanitary fixtures, including cold drinking water, is heated to above 60°C, not only addressing the risk of legionella in warm water but also the risk of it colonising in cold water post-thermostatic mixing valve (TMV). The water required for cold supply is the energy offset of the heating process and is cooled to between 15-20°C before it enters the facility. “Other systems rely on harsh chemical flushing or UV treatment to eradicate legionella in the system whereas LegioGuard prevents legionella from entering the water system in the first place,” says Scott. There are features in the system that enable the thermal disinfection of cold and hot distribution systems throughout a facility, with up to 80°C water on commissioning. The flagship unit is 30Kw with 1,200L of hot and 1,200L of cold storage, which can supply enough tempered and cold water for up to 80 rooms based on a 30% coincidence factor and 30L per person peak usage. Systems can be manifolded for larger facilities. At the heart of the LegioGuard system is an efficient water-sourced heat pump that initial performance testing results indicate has a coefficient of performance (COP) of 2.3, where 1Kw of energy results in 2.3Kw of heating/cooling. Scott says the heat pump will be undergoing further performance testing to confirm the results. The system has also been subject to extensive testing at Flinders University in South Australia, where a test warm water loop was constructed with shower, basin and washing machine outlets, and infected with biofilms and legionella bacteria. Over a five month period the system was shown to instantly remove all legionella introduced to the system and prevent it from recolonising. The installation process is no different to existing circulating type systems, with the only variation being that all the incoming potable water enters the LegioGuard system. “As the system relies on a main tempering valve, there is no requirement for end of line TMVs, which reduces the install and maintenance costs,” says Scott. Most existing facilities are able to accommodate LegioGuard, as it has been designed to be used in smaller, decentralised distribution systems. Many aged care facilities are moving to these decentralised distribution systems so that if legionella detection does occur, the entire facility does not need to be shut down. Microbiological threats like legionella are best addressed in their early stages of growth to ensure they can be properly treated, especially because under the right conditions, legionella populations can multiply to dangerous levels in just a few days. However traditional culture-based test methods take two or more days to obtain results and are very selective, with less than 1% of the total population detected. LuminUltra Technologies has developed a testing kit that overcomes these problems, providing in-situ testing that quantifies the size of the total population. “Over 20 years the company founder Phil Whalen, with his friend and colleague, microbiologist Jim Cairns, set out to develop a portable testing kit to identify bacteria in water, something that wasn’t then commercially available,” says LuminUltra Technologies regional business development manager in Asia Pacific Arthur Kokolekos. The testing kit combines a sensitive, light-measurement device with smart interpretation and analytical tools, known as LuminUltra Cloud, providing a user-friendly microbial monitoring solution. “Adenosine Triphosphate (ATP) is the molecule associated with cellular energy in all living cells so quantifying it enables you to quantify the size of the total population, rather than only cultruable cells. This gives a better indication of microbial risk,” says Arthur. “With a simple test procedure that involves a chemical extraction of ATP from any living cells in the water sample and the addition of the Luciferase enzyme, light is generated. The amount of light generated is proportional to the amount of living microorganisms in the water sample. Simply put, the more microorganisms, the more light generated. As a result, technicians are able to access water quality during flushing and maintenance activities to know when sufficient flushing has been done. 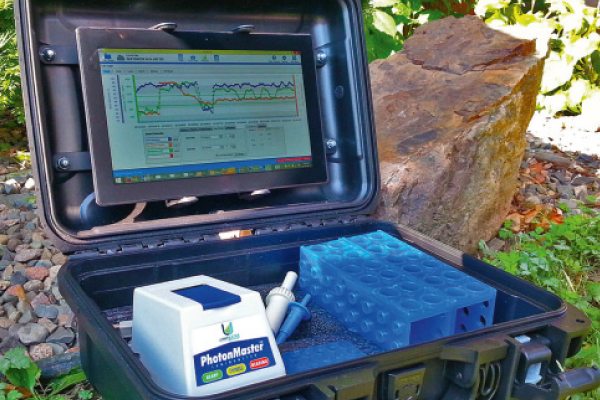 “LuminUltra’s second generation ATP testing kit provides a ‘canary in a coal mine’ when it comes to legionella monitoring,” says Arthur. According to a return on investment (ROI) case study LuminUltra produced in August, total testing and labour costs are approximately $450 higher if monitoring is completed using HPCs rather than LuminUltra’s second generation ATP testing. The company undertook a risk assessment by initially collecting nine samples from seven different locations, with biological growth assessment based on the general cATP interpretation guidelines for potable water. The ATP testing enabled operators to immediately identify high-risk areas, implement corrective actions and verify that those actions were successful. Arthur says this is the key benefit and while the financial savings are relatively minor, the time-savings are crucial in protecting public health. “Managing the microbial threats and the ability to detect emerging problems greatly minimises outbreaks and the likelihood that all your regulatory tests return negative results.